The nights are drawing in so it's time to cosy up and get creative!! We have a feast of creative workshops in store throughout September to December. Adults will get the chance to unleash their creativity with a new writing class facilitated by professional playwright Anne Mc Master. The Make, Do & Mend workshops will run on Thursday 13th September, 11th October, 8th November and 6th December from 7-9pm. Aimed specifically at writers who may be having difficulty finishing a piece of work or one that needs some attention, it is the perfect chance to learn tips from Anne. The professional writer will also host the Fourth Wall scriptwriting course for emerging writers aged 18 and over on Tuesday 18th September for 10 weeks from 7-9pm. If you have a yearning to write for the stage, this is the course for you! Fancy learning the guitar? Join Michael Watters to learn to play the acoustic guitar on Saturday 22nd September from 10am-2pm. 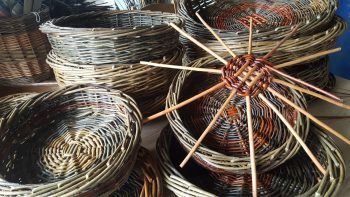 If you’d rather get crafty, Louise McLean will lead a workshop on Saturday 22nd September and teach participants how to make a traditional Irish skib basket. Louise will also facilitate a Christmas willow decoration workshop on Thursday 22nd November. Adults will also have the chance to craft their own paper clay objects on Saturday 6th October with Sandra Robinson. A one day workshop in jewellery making with tutor Dianne Lyness will take place on Saturday 20th October from 10am-4pm. This will give adults the chance to create silver stacking rings and learn techniques such as shaping, texturing and polishing. Following this, if you would like to get involved in a unique glass making workshop, Eleanor- Jane McCartney will guide participants in making a beautiful decorative glass mobile on Saturday 10th November. A Christmas glass dish making class will also take place on Saturday 1st and 8th December. If drama is your thing, then sign up for The Limelight Factory from Tuesday 2nd October to 13th November. Suitable for ages 9-18 years, Sorcha Shanahan leads this brilliant performance course combining storytelling and drama. For further information, call us on Tel: 028 7776 0650 or visit our adult learning page.